It was Wednesday morning, November 13, and it was time to go home, but still we wanted to get in one more short hike before driving back to El Paso for our flight. We drank some hotel room coffee while we loaded the car with the gear we had packed the night before. The visibility was better, but still not great. Our destination that morning was Grapevine Hills and its famous balanced rock. In my mind I was already calculating: if we arrive at the trailhead by such time and on average it takes us so long to do a hike of said length then we should be starting the drive to El Paso by that time which makes it possible to catch our flight and so forth. 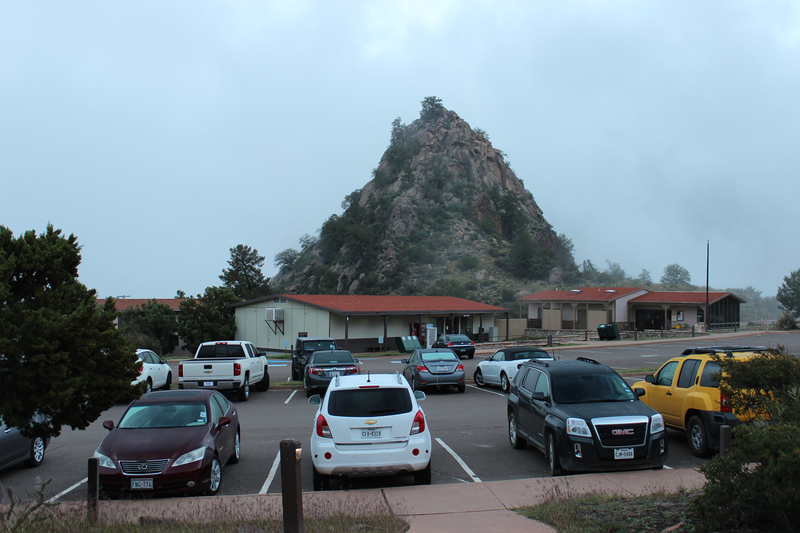 The store and visitor center are visible across the parking lot from the door of our room at the Chisos Mountains Lodge. The formation behind them is visible too. The wall of mountains behind that, which forms the north wall of the Basin, is not. 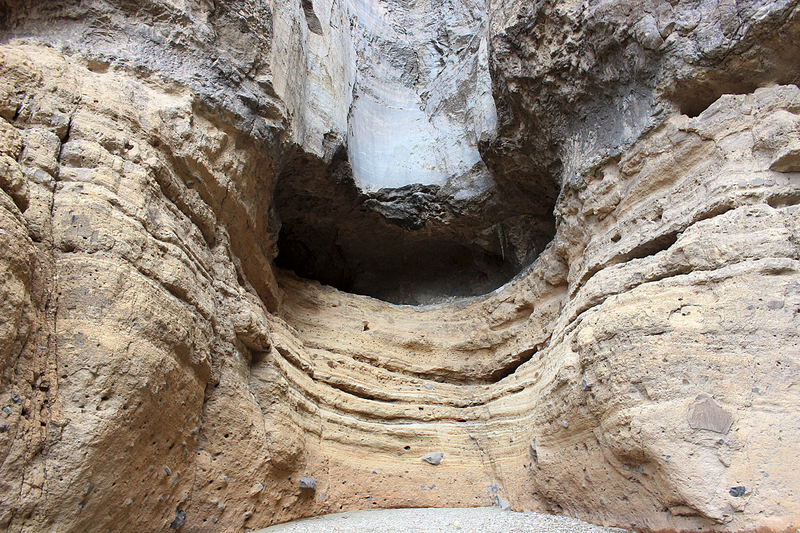 This entry was posted in Journey and tagged Big Bend, Day Hike, Texas on March 1, 2014 by Brandon Hayes. 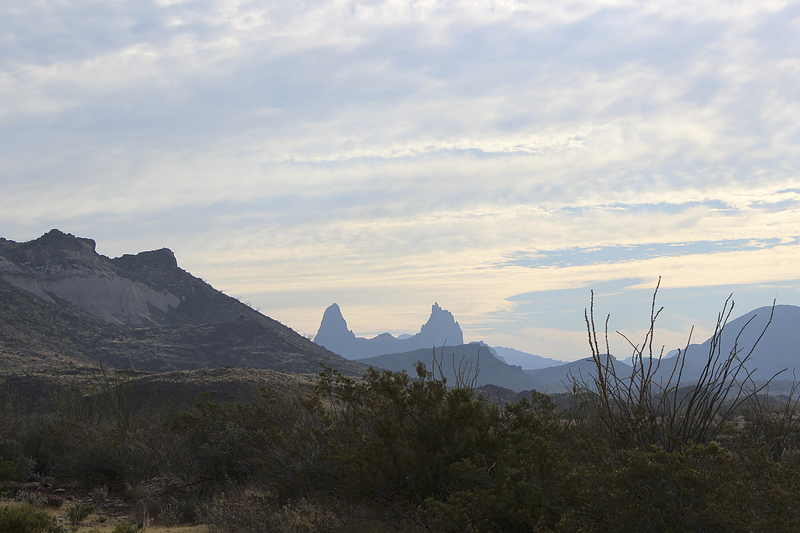 It was Tuesday afternoon, November 12, our final afternoon at Big Bend National Park. 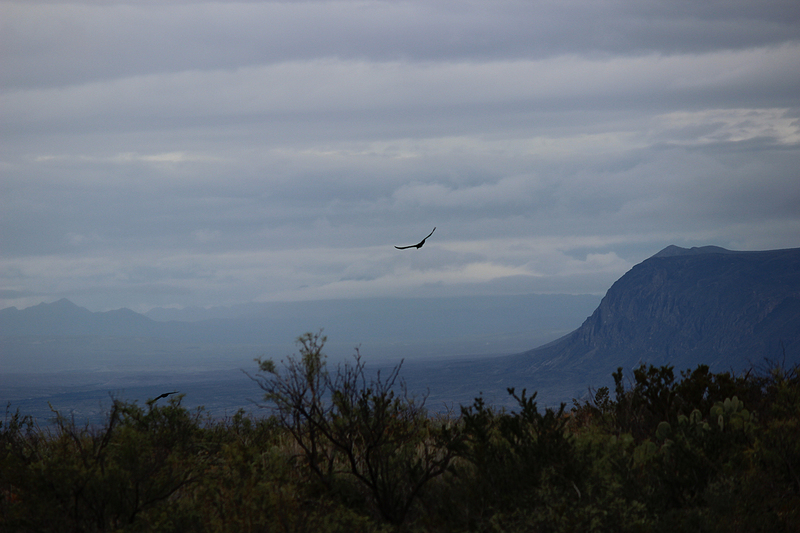 We were back in Chisos Basin earlier than we had planned, driven from the high mountains by the mist and clouds. We ate through some of our remaining bars and food for lunch, but not before I had consulted “Butterflies of the Big Bend Country” in the store to determine the species of our butterfly companion: Lyside Sulphur. We would be spending our final night at the park in the Chisos Mountains Lodge here in the Basin. We inquired about early check-in, but our room wasn’t ready. While we were in the lobby, we overheard staff talking about possible road closures, which made us a little nervous. The visibility was still horrible, and we wanted to drive down out of the mountains (in the hope that visibility was better in the desert below) and see a few more sights this final afternoon. We went into the visitor center and consulted with the ranger. He said that when he’d last had a report, the visibility at park headquarters at Panther Junction in the desert below was about the same as it was here in the Basin. But he said there was no reason or even remotest possibility that the road into the Chisos would close. He told us that this weather, unusual for the time of year, had happened often in the preceding weeks, and that some occurrences were worse than this. He also said that this time of slow seeping rain/drizzle was excellent for the desert because it would soak into the land, as opposed to sudden torrential storms that just wash over the surface. 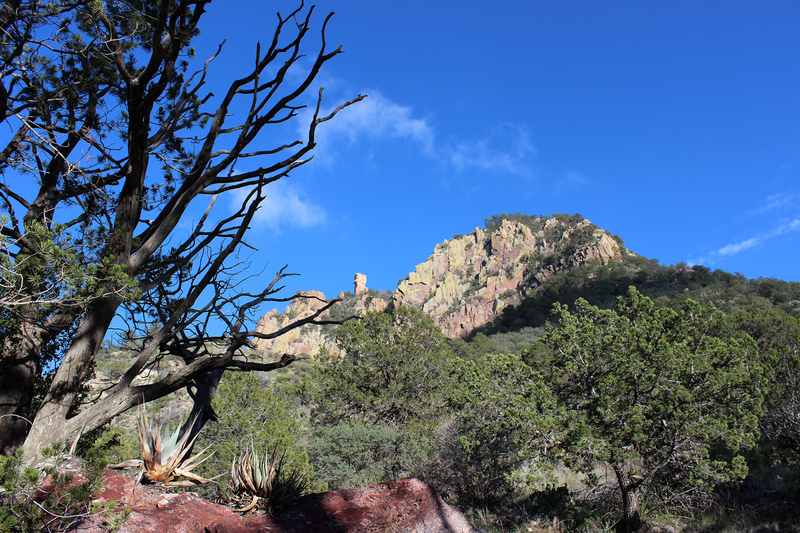 This entry was posted in Journey and tagged Big Bend, Day Hike, Texas on February 28, 2014 by Brandon Hayes. “What kind of insect?” I asked. We stopped. 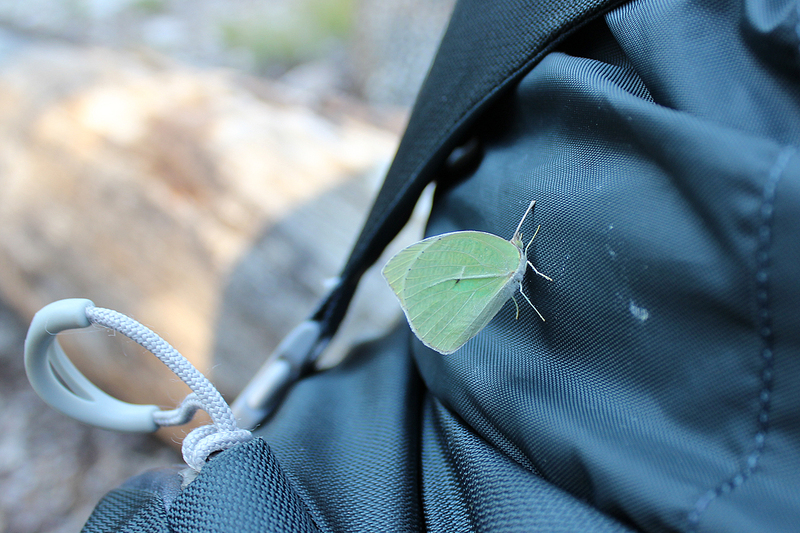 He snapped a few photos of the yellow-green butterfly. And we continued on, assuming like most times that a curious dragonfly or a shy moth landed on us during a hike, that it would soon fly away. Some forty-five minutes later, he mentioned that the insect was still there. 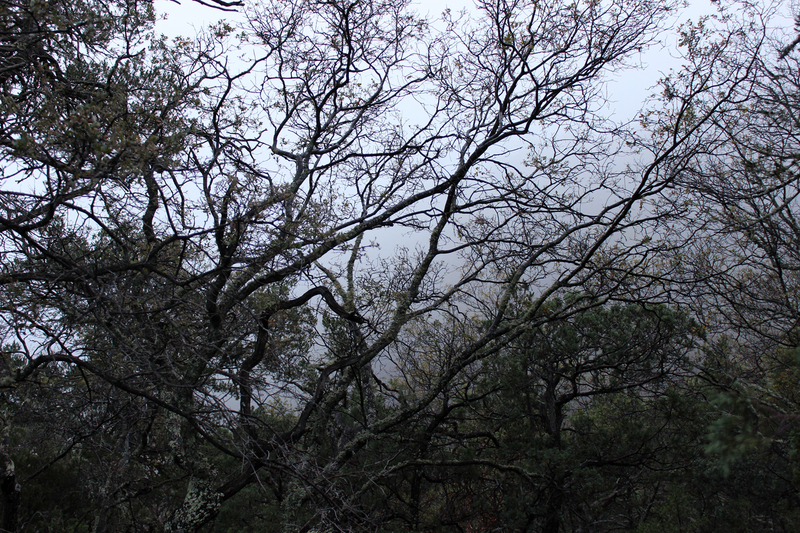 This entry was posted in Journey and tagged Backpacking, Big Bend, Texas on February 26, 2014 by Brandon Hayes. And then the clouds came. In the growing light before dawn, we were awakened by a soft rain. We made sure that our gear was covered, and climbed back into our sleeping bags to doze for another hour or so. At 7:30, I woke up in earnest. Outside our tent it had stopped raining, but the mist had rolled in, making the world chilly and moody and destroying any visibility. It was my 35th birthday, Tuesday, November 12. 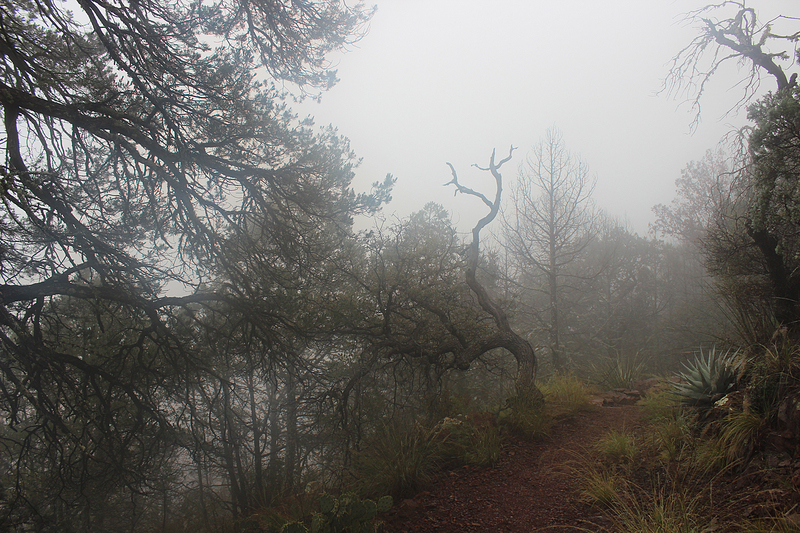 This entry was posted in Journey and tagged Backpacking, Big Bend, Texas on February 25, 2014 by Brandon Hayes. After a morning spent exploring Burro Mesa and striking our camp at Cottonwood, we drove to the heart of Big Bend National Park: Chisos Basin. We had reserved our backcountry campsite the day before and planned to hike into the mountains for an overnight backpack trip. I wanted to wake up the following morning, Tuesday, November 12, on my 35th birthday in the Chisos Mountains. 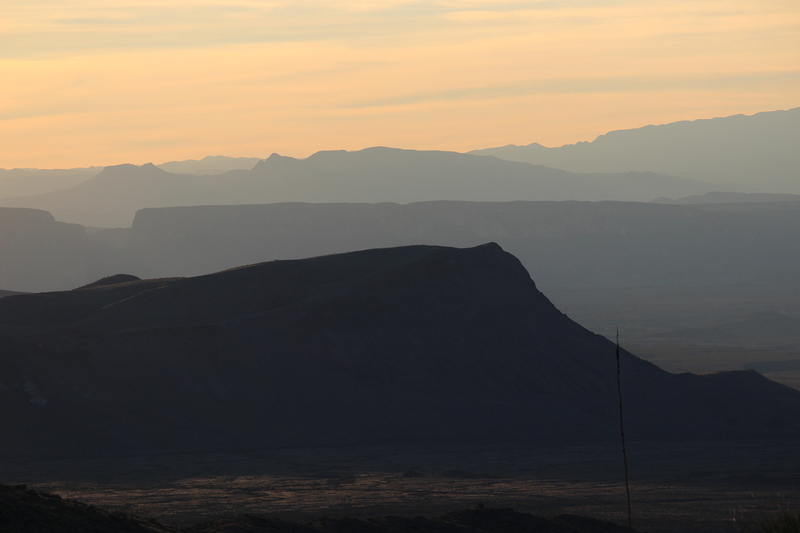 This entry was posted in Journey and tagged Backpacking, Big Bend, Texas on February 16, 2014 by Brandon Hayes. 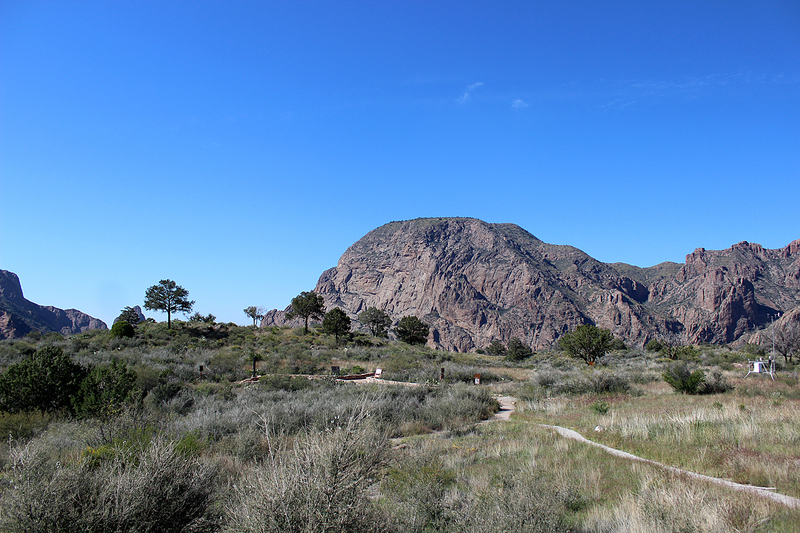 Monday, November 11, Sean and I had the morning to spend exploring the southwestern portion of Big Bend before we broke camp at Cottonwood and hiked into the Chisos in the afternoon. There were still many things to see in this part of the park, but it was time to pick just one or two. We grabbed our day packs, water, and snacks and headed toward Burro Mesa. 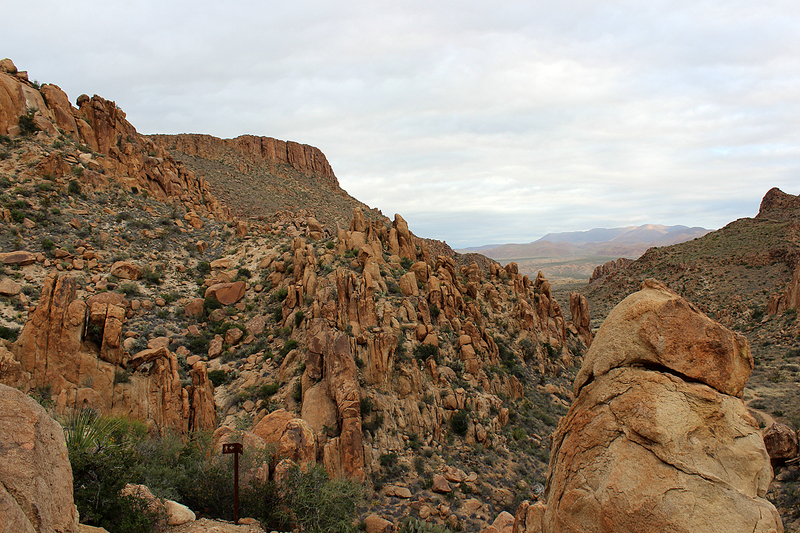 This entry was posted in Journey and tagged Big Bend, Day Hike, Texas on February 3, 2014 by Brandon Hayes. After our day of exploring three canyons, visiting hot springs, and lunching in Mexico, it was time to head back to our campsite at Cottonwood Campground. The sun was setting in earnest as we passed back around the great bulk of the Chisos Mountains at the center of the park. On the western slopes, the dramatic light of the setting sun caused us to pull over and take in the vista. 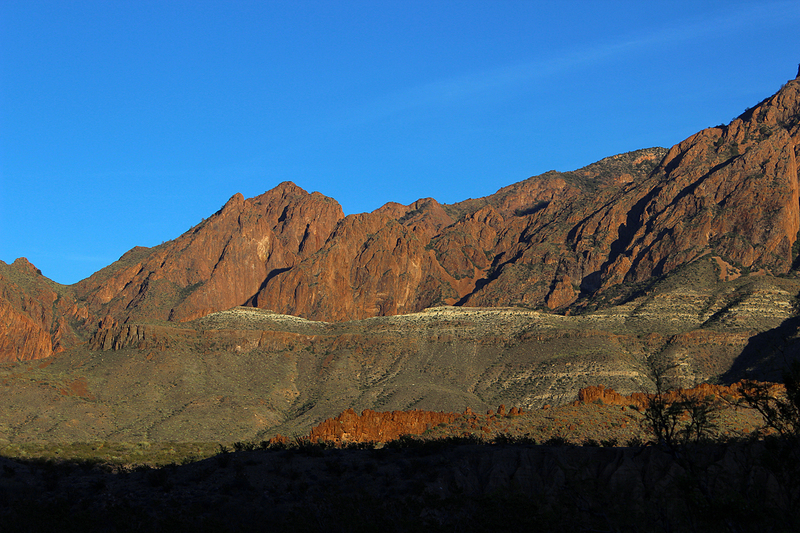 Perhaps the most striking elements of the western face of the Chisos range are the lines of igneous rock that cut like huge, ancient stone walls across the slopes. These are lines of magma that pushed up and cooled beneath the earth. The hard igneous rock that forms them was left standing when the softer sedimentary deposits eroded away. In the light of the setting sun, they were particularly striking. This entry was posted in Journey and tagged Big Bend, Texas on January 1, 2014 by Brandon Hayes.